Hooray! It's the first long weekend of this year. I can finally have time to do my new blog post, plus tons of other housework. This is one of the ways to enjoy my personal time. I mean the blogging part, not the housework. Whenever we have time on weekends, we like to make a big deal for breakfast. I personally not a big fan of big breakfast but N likes his to be like a brunch. I enjoy the making of it. Pancakes with sausages, waffles, scones, are our favorites. Yesterday, however, instead of making the usual with butter, I, for the first time, used applesauce as baking ingredients for muffins. I have read lots of recipes for low-fat baking using applesauce before but I have never tried it because of the skepticism about replacing butter in any type of baked goods. Butter is supposed to be the heart and soul of yummy baked goods. 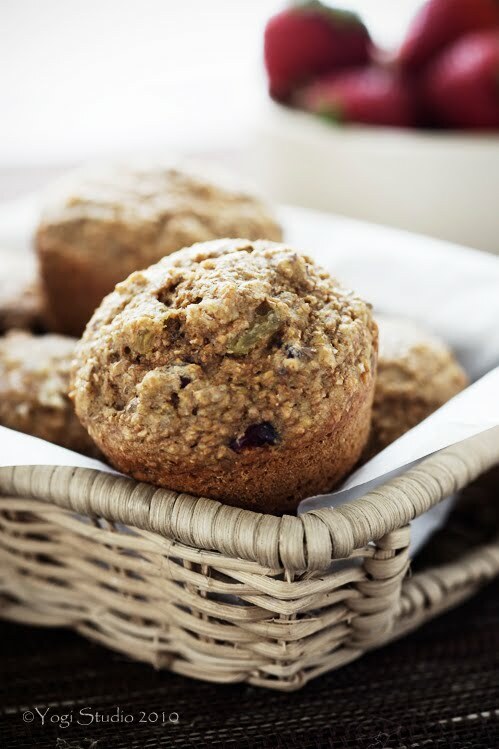 But inspired by the gorgeous Morning Glory Oat Muffins of Honey and Jam, I finally tried baking with applesauce and I am loving it. 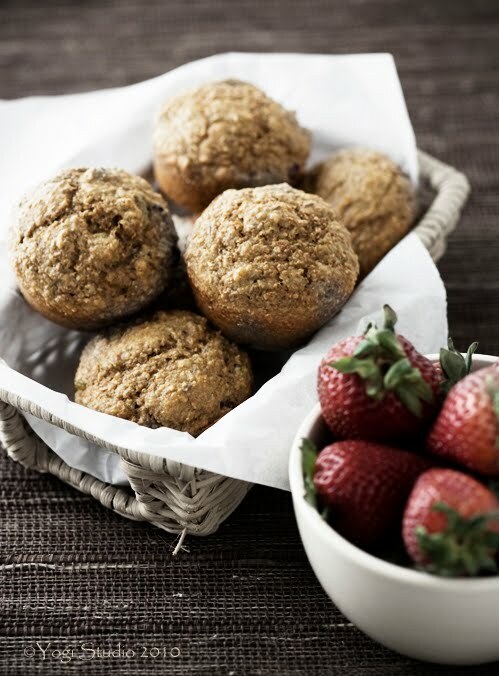 This recipe of Buttermilk Bran Muffins was found on Epicurious and is originally published in Healthy Oven Baking Book of Sarah Phillips. It is a very basic recipe. You can add any ingredients like dried fruit, nuts to your liking. I added raisins, cranberries and flaxseeds. The applesauce and buttermilk really moistened the muffins. With the use of raw sugar, the flavour of the whole wheat and bran is deepened. I like how light the muffins are. For N, no matter whether there is butter of not in the muffins, he would put a large pat of margarine on it when he was eating it. So, he really did not miss the butter in the muffins at all. Lightly greased or spray twelve 2 1/4" x 1 1/2" nonstick muffin cups with oil. In a medium bowl, whisk together wheat bran, flours, baking soda and salt. In another medium bowl, using a handheld electric mixer set at high speed, beat the buttermilk, sugar, applesauce, egg, oil and vanilla until frothy, about 2 mins. Make a well in the centre of the dry ingredients and pour the buttermilk mixture. Stir until just combined. Add dried fruits and flexseeds or other nuts of your choice. Mix until just combined. Do not overmix. Spoon batter into muffin tray. Bake until the tops spring back when pressed gently in the centre, about 20 mins. Do not overbake. Cool in the pan on a wire rack for 10 mins before serving. 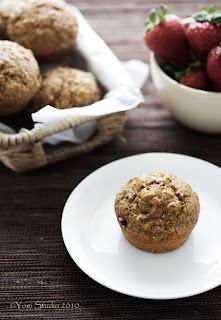 These muffins are fabulous and healthy to boot so naturally Im already adoring them! Yum, delicious and nutritious! Thanks for sharing! Jennifer, Michelle - Thanks for dropping by. Yes, these muffins are healthy and yummy. Please do try them out! Kris - Thanks for pointing that out. I've added that back on. I used 1/4 cup unsweetened applesauce. I just discovered your website, and I love all the fresh recipes you have! Nicole - Thanks for visiting. I'm glad that you like the recipes. 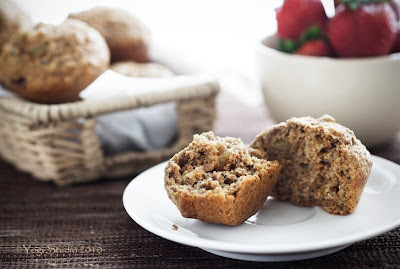 Such healthy and hearty gorgeous muffins. A great recipe for a breakfast muffin. Loved your blog.. The photos and the recipes are great!! Have a good day, I'm going to bake these right now! My friend loves bran muffins. Natalie Veronique B. - Thanks for pointing out the typos. That's what happened when you wrote your blog post late at night! P.S. Oil is correctly mentioned in step 2 and not step 3 with the dry ingredients.